Welcome to the first of two live versions of The Adelaide Show Podcast, as part of the Adelaide Podcast Festival. This is NOT our usual format but that will return in episode 186. Special thanks to Rumpus Room Studio for some great photos of the night. Tonight, our guests are Alexis Cattely and Pete Ebdel from The Show on PBA-FM. And we’ll be discussing the BAD Diet – a Balanced Audio Diet. How do you get balance in your audio diet? 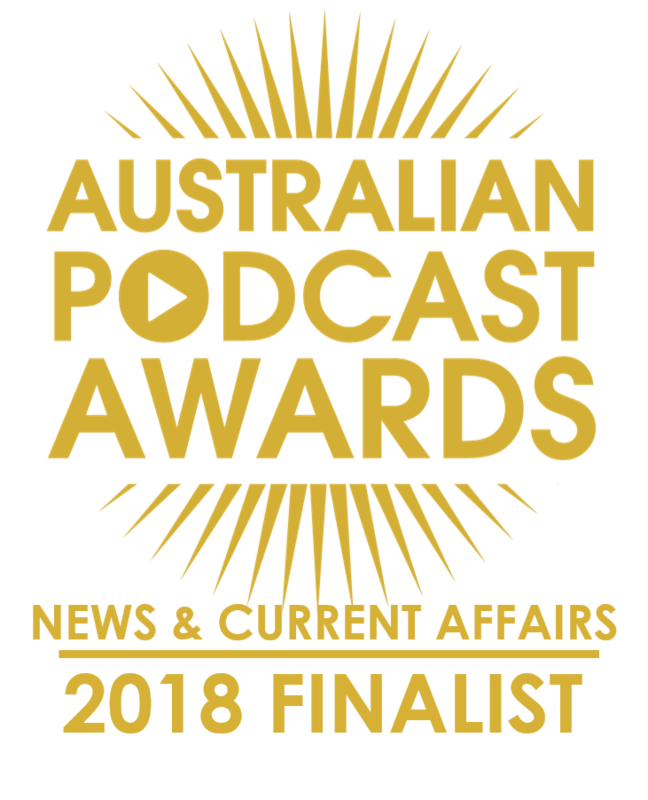 Does it include commercial radio, community radio, the ABC, podcasts, music, or other types? We’ll also be wanting to find out what the audience thinks makes a good interview. Dr Bill Griggs, Director Of Trauma at the Royal Adelaide Hospital will be back with a snippet from last week’s interview that didn’t fit. In it, he goes into detail about how he would re-engineer our roads for better safety outcomes. Steve will try to stump the audience with IS IT NEWS on the topic of unusual crimes in South Australia. Plus, we’ll start a regular feature of sharing a snippet from 100 shows ago. This week, it’s been 100 weeks since Sharon from Kytons Bakery joined us. We play a tasty slice. And the Power Sprites will take us home with Fly On The Wall in the musical pilgrimage. 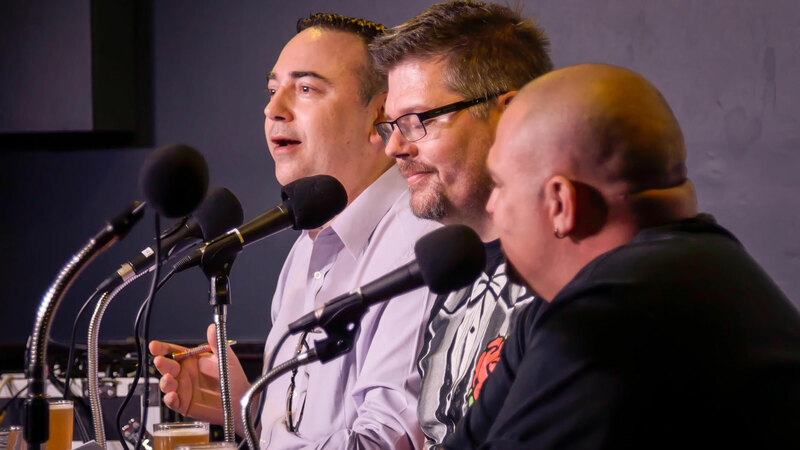 Suggested Tweet text: #TheAdelaideShow was live this week with @TheShowPBAFM crew for The #Adelaide #Podcast Festival. The BAD Diet – Balanced Audio Diet. How do you structure yours? A snippet that didn’t make the final version of episode 183 in which Bill explains how he would re-engineer our roads for greater safety outcomes. A snippet of Sharon from Kytons Bakery, who joined us in episode 84 to talk about making Hot X Buns under pressure each Easter. We occasionally review what people are saying about Adelaide on social media, Twitter in particular, and grant Adelaide Visas to those who deserve them, revoke Adelaide Visas from those who have disrespected our city or state without good enough grounds, or place users on a watch list. Are you guys actually using my name to promote your Podcast? After what went down, that’s a bit creepy. No? Mrs. Ferguson, wife of Mr, James Ferguson, of the Boulder Telegraph Department, was sitting in front of the fire with a friend when she noticed an unusual array of sparks from the fireplace. A short piece of fuse had been attached to a piece of firewood which, in the firelight, had given the object the appearance of dynamite. Detectives were summoned and the conclusion drawn that the sole purpose of this crime was to scare Mrs. Ferguson. A woman named Charnley has since been arrested for complicity in making the phantom device and for causing a disturbance. It is said that Mr Ferguson was, for some months, keeping company with Elizabeth Charnley, daughter of the woman arrested, but that a couple of months ago he jilted her to marry his present wife. Adelaide’s carnival of crime continues, and armed desperadoes go on their merry way very much unchecked, pillaging and plundering at the point of the revolver wherever opportunity offers. and terrifying helpless women out of their wits. They are having a veritable picnic. The city of churches, so long immune from such crimes, is now the headquarters of a gang of clever ruffians, whose depredations are planned and carried out with such marked success as to point to their being criminals of long experience. The latest outrage reported was that of a burglary at Unley on Wednesday night, when two men visited the residence of Mr. Hilary V. Neale, at the comer of Arthur and Queen streets, and, after terrifying Mrs. Neale into helplessness with a revolver, ransacked the place and decamped with £7 in money. The story of the robbery is best told in the words of Mrs. NeaJe, who was yesterday interviewed concerning the matter. Mrs. Neale is a bright, pleasant-fairhaired little woman, but she was trembling with nervousness, and was evidently greatly distressed as a result, of the intense strain to which she had been subjected on the previous night. “My husband was expecting a visitor last night,” said Mrs. Neale, “but when 8 o’clock came he waited no longer, and giving me a note for the young man in case he came, went out. Between half past 8 and 9 o’clock I was sitting alone in the breakfast room when I heard a knock at the back door. I immediately got up, thinking that this must be th-unexpected visitor, and without the slightest fear, I went and unlocked the backdoor. The house was securely fastened as there was only myself and my little daughter Alma, who was asleep in bed, at home. He then raised his hand quickly, and I thought he was going to hit me, so I moved back. There was no need for him to have pointed the revolver at me,” continued Mrs. Neale, “for I was so frightened that he could have taken everything in the house, and I could have offered no resistance. To tell 3-ou the truth, I was paralysed with fear. As soon as he had stepped up through the doorway another man, who must have been hidden in the shadows, for I had not seen him, followed, and without saying a word, walked right through into the house. The man with the revolver stood in front of me all the time. I tried to call out but my tongue refused to move, and I could not utter a sound. I was so overcome with fear that I could hardly stand, and felt as if I were going to faint. It seemed to me that the other man was inside for about two hours ransacking the place, but in reality I found out afterwards that it was only about 20 minutes. “Silly Willies,” magsmen, confidence men, “rich farmers,” pickpockets, and others who are confidently expected during Show Week to make their presence felt have not been operating this week. Robberies at five hotels have been the chief concern of the police. Confidence men are here in force, according to the police, but such a close watch has been kept upon them that not one report of a victim succumbing to their wiles has been brought under notice. Card sharpers who made it a practice of “working” trains have been given such a warm time in the Other States by, the police and the press that they have migrated to Adelaide. Detectives have kept these men under close supervision, with the result that their activities have been severely hampered. Never play cards with strangers in a traiin. That is the strongest, best, and only advice that I can give to people who would safeguard their own in interests. By stealing motor cars which were subsequently abandoned thieves have been able to carry off their booty from hotels. The licensed houses visited were the Aldgate Hotel, the Stirling West Hotel, the Larg’s Pier Hotel, Largs Bay, the Broadway Hotel, Glenelg, and the Reynella Hotel, Reynella. Money in the cash registers was the chief objective of the thieves, but they did not scruple at taking bottles of wine and spirit. Silverware to the value of £40 was stolen from the Reynella Hotel. The registers at the Aldgate and Reynella Hotels were each relieved of £4 10 shillings. Windows were forced in order to gain entrance to the premises. And our song this week is Fly On The Wall by Power Sprites, selected by our musical curator Dan Drummond. Not a euphamism … You’ll hear that later!